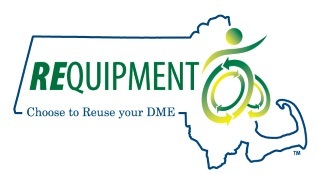 How refurbished durable medical equipment (DME) has benefited real people here in Massachusetts! Note: the following stories come from the REquipment program as well as other community-based reuse programs in Massachusetts that are not all (yet!) a part of the REquipment network. Alice has complications from diabetes. She requires a manual wheelchair and a walker to assist her mobility. MassHealth provided both, but the walker did not have a seat and was difficult to use inside on carpets. Alice wanted to build her strength and knew that relying on the wheelchair, alone, wouldn't help her do that. For this reason she applied to MassHealth for a rollator. MassHealth, however, denied the request, having already paid for the other equipment. Alice was too discouraged to appeal. That’s when Jodi Watson, her Mass Rehabilitation Commission (MRC) case manager, suggested REquipment. Through the REquipment program, Jodi personally delivered a refurbished rollator to Alice at no charge and with no hassle. When Alice saw it she cried tears of joy and hugged Jodi. A man was ready for discharge from Spaulding Rehabilitation Hospital to his home in Plainville. His insurance approved him for a mechanical lift to assist with getting in and out of bed but would not approve an electric lift. The situation was extremely stressful for the man's wife who has a small frame. She knew she would not be able to operate the mechanical lift successfully for her husband. REquipment provided the couple with a fully-electric sling lift, making a big difference for their quality of life! A medically fragile woman was ready for discharge from a rehabilitation facility in Cambridge. To return home she would need a manual wheelchair to help her get around her apartment. Prior to entering the facility, Medicare had rented her a wheelchair, but the chair had been returned when she went into rehabilitation. 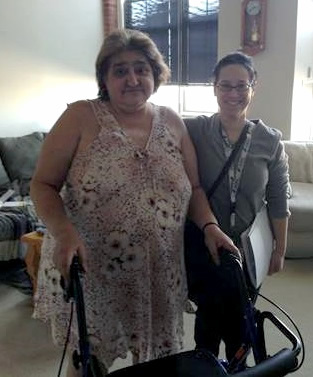 REquipment provided a manual wheelchair that was hers to keep and enabled her to transition home successfully. An 18-year-old woman traveled to the U.S. from Tanzania for medical assistance. After extensive surgery (including a leg/hip amputation), she was ready for discharge but needed several pieces of durable medical equipment to do so safely, and she had no insurance or funds to pay for them. REquipment collaborated with a program in Central Massachusetts to provide her with an electric bed, a mechanical lift, and an over the bed table--all essential to her recovery. With this refurbished DME, she was able to leave the hospital to recover at a family residence in western Massachusetts. REquipment was contacted by a widow on the Cape with several pieces of equipment to donate after her spouse passed away. These included a custom-built exterior wheelchair ramp for home access. The program matched the ramp to a family on the South Shore who needed to make their home wheelchair accessible so a family member could easily enter and exit. For 23 years Peter used a manual wheelchair. Then in 2014 he found he could no longer push his chair all day. Fatigue, pain and tingling in his hands and arms prevented him from traveling long distances or walking his service dog as he always had. His life was becoming increasingly limited, yet his insurance would not pay for a power wheelchair. Relief arrived when his friend, Charlie, contacted a local DME reuse program. He obtained a power wheelchair to repair for Peter at no cost. Peter has since regained his independence. A 5-year-old boy with cerebral palsy and his mother were looking for permanent housing in Lynn. Without a wheelchair, the boy was carried everywhere by his mother and he could not attend school. A local DME reuse program provided the family a refurbished manual wheelchair and the child was able to go to school and move around the community. The parents of an 11-year-old boy on the North Shore relied on a mechanical lift and swing to move their son from bed to wheelchair. When the equipment failed they applied for new equipment through their insurance but learned the process would take several weeks. In the meantime, their son could not leave his bed to go to school and the family faced a crisis. The situation resolved, however, when a local DME reuse program provided the family a refurbished lift and sling while they waited for his new equipment to be delivered. A man with a spinal cord injury was ready to leave Spaulding Rehabilitation Hospital in Boston. His occupational and physical therapists had prescribed him a customized power wheelchair to meet his needs, but it would take months to receive. This is a common problem for individuals in rehabilitation facilities: lack of needed equipment can delay discharge. In this case the man received a refurbished power wheelchair through a local DME reuse program while waiting for his new equipment. The power wheelchair enabled him to leave the facility on schedule and return home to attend outpatient therapy.